EVERY TIME I FIND THE MEANING OF LIFE, THEY CHANGE IT. Daniel Klein. Penguin. 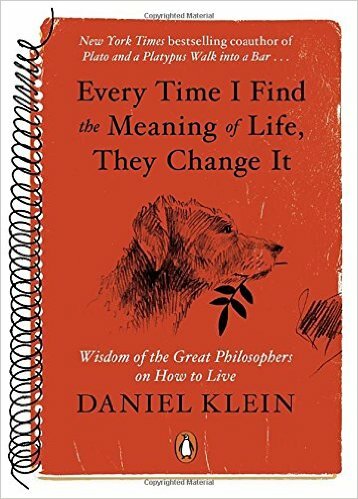 Set for release on October 27th, Daniel Klein’s Every Time I Find the Meaning of Life, They Change It artfully takes pieces and primers from the philosophy classes that we’ve all forgotten and applies them to the mechanics of daily life. The result is this incisive exploration into the question of what the hell we’re all doing here. The idea-germ for Every Time was born in Klein’s youth: As a student, he methodically wrote down quotes from the world’s foundational philosophers and then went back to study them, looking to extrapolate the reason behind his own life. Now, decades later, Klein has revisited that notebook to examine where the roads have led, sifting through all that was gleaned from the journey. In turn, he’s sharing his personal story in a way that forces each of us to question our ledgers: “Existence precedes essence,” notes Klein, quoting the great teacher, Jean-Paul Sartre. To me, this line means that the role I was meant to play out on earth was shaped long before my mind was actually touched by the existential voice of the universe. Yet, it’s not just about what the line means to me. Going further, Klein compels Every Time to help you discover what Sarte’s statement holds for you. This entry was posted on November 2, 2015 by Jacob Aiello in 2015, In the Spotlight, November 2015, Rat On Fiction & Nonfiction and tagged Book Review, Books.